Today I am home alone and everyone left home early so no mood to cook for me. So In leftover bread I made very simple, easy and yummy upma for myself... This is a very tasty and it can be made in a jiffy. I tweaked it a bit to include more veggies and made healthy & colorful with seasonal vegetables. 1.Cut the bread slices into cubes. (Remove the brown part) . 2. In a pan heat oil, add mustard seeds,urad dhal let them splutter and add curry leaves, green chilli. 3. Add chopped onion pieces and saute them till they are transparent . 4.Then Add chopped tomato and saute till they well cooked and mushy . Then add veggies and saute for few min.Then Add salt , Red chilli, turmeric pd, cumin, coriande powder and mix well. 5. If the mixture is too dry you can add few tbsp's of water. 6.Add the bread slices and stir till it is nicely covered with all the masala's. 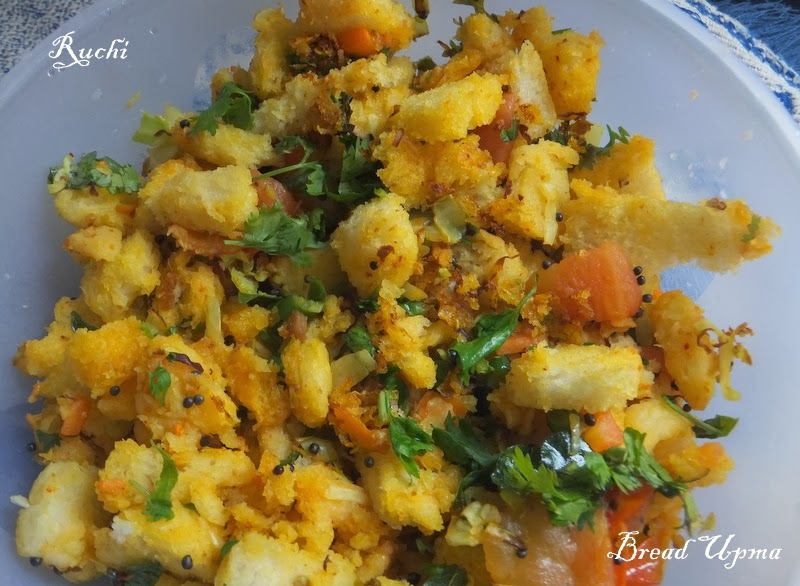 7.Add lemon Juice-garnish bread upma with coriander leaves to garnish and serve hot. looks very nice. Very happy to follow you. Looks delicious! Easy and quick dish to put together for one person!